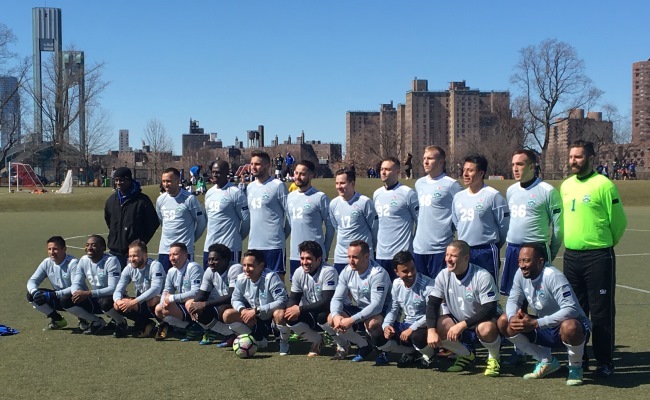 A no-show from Bronx Supreme and a stalemate between Spring Valley and Celtic are some of the weekend’s results around the Cosmopolitan Soccer League’s 2nd Division. The Galicians conquer at Randall’s! Club Deportivo Iberia won 6-2 over Williamsburg International FC at Randall’s Island this past Saturday. Currently, they still sit in 5th in the Southern Division and haven’t moved much up the table. With a record of 6 wins, a single tie and 6 losses, they have to rely on good performances against Beyond FC, NY Ukranians and Panathinakos USA to end their season on better terms. Williamsburg International are on back to back losses but sit above Iberia in the table in 4th. Champions of the Metro Division 1 last season, they are finding it hard to keep a decent run of form and have to play their last 2 matches of the season against Panatha USA and Hoboken FC 1912. In the North, 3rd place Malatyaspor USA against 8th place Sporting South Bronx ended in a 5-1 win for the latter late night at Randall’s Island. Head Coach Ed Romero left the pitch in a better mood after their team gave a high scoring performance against Malatyaspor USA. While top spot seems far away entering May, it’s all about improvement on and off the pitch and in the dressing room. “Right now, we just want to end our season on a positive note. We will continue to play spoiler. We are also looking forward to the offseason to prepare for next season.” Romero told the League. A hard fought 2-2 draw at the North Rockland Soccer Complex this past Sunday was all Spring Valley and Manhattan Celtic could manage. Manhattan Celtic missed a chance to jump to 4th in the Southern Division, scraping just a point away from Spring Valley. While Spring Valley haven’t been defeated since mid-November, New York City-based KidSuper Samba AC are nipping at their heels at 26 points in the North in comparison to Spring Valley at 28 points. The contention for playoff spots for the month of May is heating up in both sides of the Division. Polonia Gwardia sweep aside Stal Mielec NY! Gwardia gave an attacking masterclass against Polish neighbors Stal Mielec NY, thrashing them 6-1. Finally taking a win against Stal Mielec for the first time this season, it was an overwhelming one as Polonia thrive in 2nd place in the South with a record of 10 wins, 2 draws and a single loss. Polonia have a good chance of keeping form of games against bottom-dwellers FC Japan and Panatha USA, with the last game of the season against Hoboken FC. Stal Mielec NY aren’t away from top spot either - this loss to Polonia is their first loss since October 2017. With a record, of 9 wins, a tie and 4 losses, this game might just be a speed bump rather than an obstacle. They play 6th place NY Ukranians next and see their last game against 7th place Japan. Hoboken blank past Beyond FC in Secaucus! Another dominant performance by New Jersey’s own Hoboken brushing Beyond FC aside at Laurel Hill Field. Beyond FC hasn’t had the best in the Cosmo League since their arrival in the league in 2012. Dwelling the bottom half of the table for quite some time, they became victims of Hoboken’s front line on Sunday, getting 6 past them. Hoboken are now on 35 points, top of the South are looking in prime position to end the season in style. Already celebrating their Reserve side’s unbeaten League title this season with a whopping 63 goals scored, 13 conceded. The future is bright for the playoff contenders. Brishna won 2-0 against NYPD FC at Flushing Meadow Field. Tough times for NYPD as they collect another loss, suffering a second loss to Brishna. It’s their 8th loss in 14 matches and are sinking down the table with Sporting South Bronx trying to achieve a top-half finish. Brishna have been able to maintain good form by scoring as much as they concede, scoring 37 goals but allowing 38. They now sit in 4th in the North while NYPD sit in 7th. Bronx Supreme FC have, unfortunately, forfeited yet another match against Central Park Rangers Reds. As Bronx look set to stay bottom of the league with their 5th consecutive forfeited league game, we look forward to seeing them resume their season as they sort their team operations. NY Ukrainians won over FC Japan 4-1 as Randall’s Island. The Japanese couldn't put a good showing for this encounter and need to put their game faces on for next month’s matches.